An artist’s rendering of the planned B-21 bomber. Washington – Pratt & Whitney in East Hartford will build the engine for the Pentagon’s new super secret long-range strike bomber, Air Force Secretary Deborah Lee James said Monday. 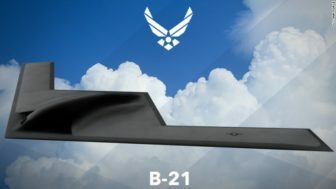 The new bomber, which has been called the B-21, will be built by Northrop Grumman. The Air Force has kept the identities of the suppliers and subcontractors secret, citing national security. Besides Pratt & Whitney, James said BAE, Rockwell Collins, Spirit Airlines, JKN Janacki Industries and Orbital ATK will help make the bomber’s airframe and work on mission systems. James said the plane would use an existing Pratt and Whitney engine, but did not specify which one. Speculation has centered on the PW9000. The announcement of the suppliers came just days after the General Accounting Office rejected a protest from Boeing and Lockheed Martin Challenging the award of the bomber’s contract to Northrop Grumman. The long-range stealth bomber will eventually replace the B-52 and B-1 bombers. The Air Force intends to purchase 100 aircraft for approximately $550 million each over the next 20 years. James said much about the new bomber will be kept under wraps. The awarding of the engine contract to Pratt & Whitney is a blow to General Electric, the only other company considered able to make the bomber’s engine. The Air Force declined to reveal much about the contract granted Northrup Grumman, except that it is a “cost-plus” contract. Such contracts have been blamed for huge cost-overruns in weapons systems. President Obama asked Congress for $1.4 billion to continue work on the bomber in FY 2017. Senate Armed Services Committee Chairman Sen. John McCain, R-Ariz., said he would block authorization of money for the bomber unless the Pentagon scrapped the cost-plus contract. Air Force Chief of Staff Mark Welsh III said the Air Force decided on the cost-plus contract because Northrop Grumman is taking on risk in building the bomber. He also said Air Force officials would continue to meet with McCain over the issue. Despite the hurdles ahead for the bomber, Connecticut lawmakers hailed the awarding of the engine contract to Pratt & Whitney, which will assemble the engine for the bomber in its Middletown facilities. “Pratt and its work force are second to none in producing the planet’s best airplanes for our national security,” Blumenthal said.